This was an incredible and fortunate find and very limited as we only have a small section of the propeller. This is the first Battle of Britain aircraft we have ever found and we've been looking for many years. Lionel Harwood 'Buck' Casson was born at Sheffield on 6th January 1915 and educated at Birkdale School and the King's School, Ely, before embarking on a career in the steel industry. Although working in a reserved occupation he joined 616 (South Yorkshire) Squadron, Auxiliary Air Force at Doncaster on 6th April 1939. Called to full-time service on 24th August that year Casson went to 2 FTS Brize Norton on 7th October to complete his training, rejoining 616 at Leconfield on 6th April 1940. After further training at 6 OTU Sutton Bridge, Casson was posted to 501 squadron in France on 15th May. He never arrived, his train being bombed firstly at Amiens and again at St. Roche, where his equipment was destroyed. He made his way to Rouen on foot and secured transport to Cherbourg, from where he was shipped back to Southampton. Posted to 79 Squadron at Biggin Hill, he managed to rejoin 616 at Leconfield on 7th July. In late August Casson and P/O T Murray were loaned to 615 Squadron for two days to pass on their Hurricane experience. Casson and his colleagues were being scrambled three or four times each day and losses mounted, in a five-day period 10 pilots were killed or wounded. 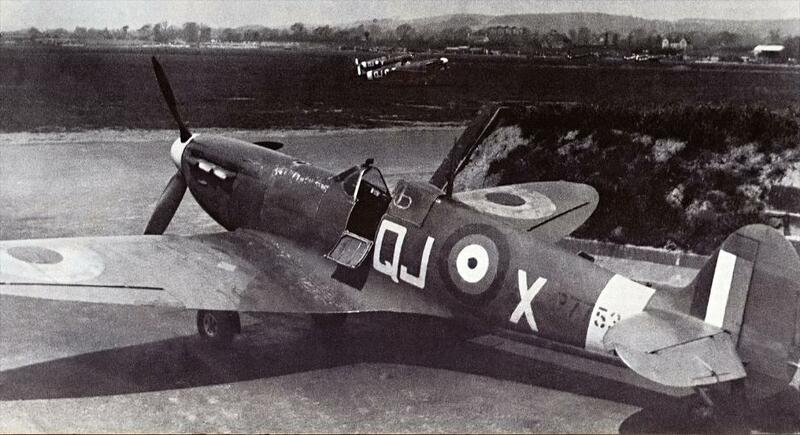 On 30th August Casson was credited with a probable and a damaged He111. Two days later he claimed a Me109 destroyed followed by a Do17 destroyed on 1st September. The squadron was withdrawn to Kirton-in-Lindsey on 4th September with just seven of the original 21 pilots fit to fly. With barely 300 hours flying time, Casson was now a veteran, he remained with 616 to train new pilots and to fly patrols over coastal convoys and combat the Luftwaffe's night blitz in December. Still with 616 in 1941, on 26th February he was scrambled with F/O R Marples to intercept a Ju88. They put the rear gunner out of action but Casson's engine overheated with a glycol leak and, with fire imminent, he had to bale out as they crossed the coast. His Spitfire P7753 came down at Priors Lea near Littlehampton. On 5th May he shared in the destruction of a Ju88 at dusk but was hit by return fire and was forced to bale out over Chichester harbour. He claimed a Me109 destroyed on 23rd June. Throughout the summer of 1941 the Wing was heavily engaged over northern France escorting bombers and flying offensive sweeps. Casson destroyed a Me109 on 22nd June, claimed one damaged two days later and in July claimed two Me109's as probables. The squadron suffered heavy losses and Casson was appointed B Flight Commander. On 9th August, on Circus 68, Casson was shot down by Hptm. Schopfel of JG26 in Spitfire Vb W3458 Mirfield, coming down at Les Attaques near Marquise. He set fire to the aircraft before he was captured. W/Cdr. Douglas Bader was also lost in this engagement and there has been unproven post-war speculation that he was accidentally hit by fire from Casson's aircraft. Casson ended up at Stalag Luft III at Sagan. While there it was announced that he had been awarded the DFC (gazetted 16th September 1941). During his years in captivity Casson's talents as a draughtsman were put to good use by the camp's escape committee. He maintained a detailed and highly illustrated diary of events throughout his imprisonment, which he was able to retain despite the privation he and his colleagues suffered when driven on foot ahead of the Russians during the severe winter of 1945. On returning home Casson rejoined the steel industry in Sheffield. On 3rd May 1947 he rejoined 616 at Finningley when the (now Royal) Auxiliary Air Force was reconstituted. In January 1951 Casson was promoted to Squadron Leader and appointed CO. His exceptional leadership resulted in the award of the Esher trophy, awarded annually to the most efficient RAuxAF squadron. Casson was awarded the AFC (gazetted 1st June 1953) for his service in command of 616. He was also the holder of the Air Efficiency Award with Bar. Lional Casson passed away on 8th October 2003, his wife Dorothy survives him.